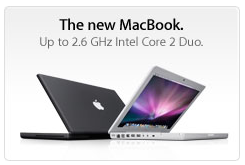 Apple's hot news page is rotating an advertisement for "The new MacBook. Up to 2.6 GHz Intel Core 2 Duo." The only problem is that the current MacBook tops out at 2.4GHz. It appears that this most likely represents a mistake rather than a true leak, though there were some unconfirmed rumors of a MacBook/MacBook Pro update last week. Update: Apple has updated the text of the image to read "The new MacBook. Up to 2.4 GHz Intel Core 2 Duo," reflecting the high-end processor available in the MacBook line since its last update in late February.